Below are common Azure App Service issues. We can't support APM with this setting enabled. With this setting enabled, you are likely to get a couple minutes of data and then APM will abruptly stop. A little back-story: because we collect the data out-of-process via the web job, we have to output to D:\Home as D:\local is per process so D:\local for w3wp.exe can't be accessed by any other running process. Microsoft docs state that "D:\Home will point to the local cache." Unfortunately, we cannot, via Kudu, access the local cache drive which is on C:. The advice is to not use this setting. If you are using multiple deployment slots, you will want to install the site extension for each deployment slot. This is required so when you are swapping slots everything works correctly, as site extensions are part of what is swapped. Setting Stackify.Environment is also important so we can identify which slot is which. If you are trying to deploy your application and getting an error about StackifyWebJob files being locked, you may need modify your deployment settings. 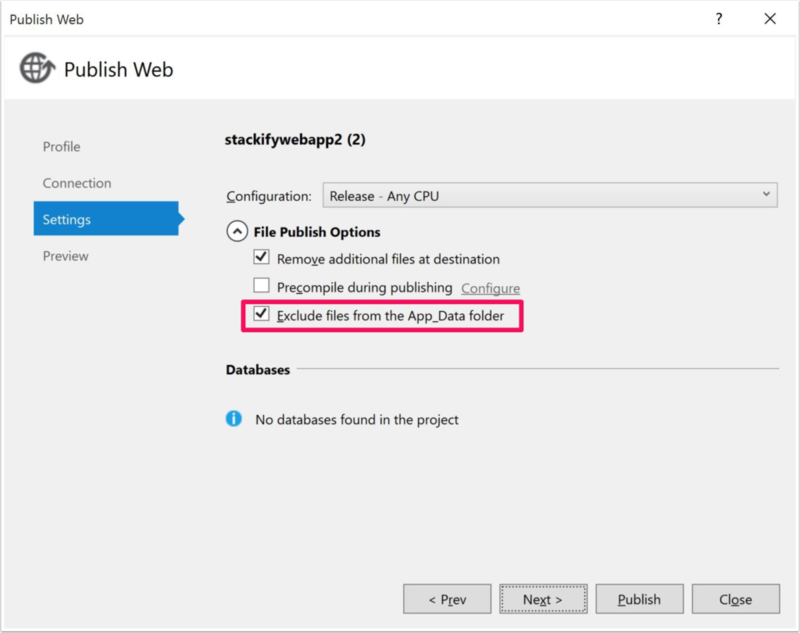 Stackify runs as a WebJob that is installed via the Azure Site Extension in to your App_Data folder. If you are trying to use the optional deployment setting of "Remove additional files at destination" this would try to remove our WebJob. Error: Web deployment task failed. (Web Deploy cannot modify the file 'StackifyWebJob' on the destination because it is locked by an external process. To fix this, also select "Exclude files from the App_Data folder" so the Stackify WebJob is not affected by the deployment. This setting is shown below in the Visual Studio UI as part of the publish options. It is important to note that fully stopping and then subsequently starting an Web App, Webjob, or Web Service inside of Azure can function differently then a normal 'Restart.' All these actions are in the control panel of the Azure Portal. If APM data doesn't show following a restart, a full stop/start has shown to work in some instances.